Hangin' With The Nuss: Question: What's Darrell Jackson been up to in San Francisco? Question: What's Darrell Jackson been up to in San Francisco? Answer: Pretty much the same thing he was always up to in Seattle. 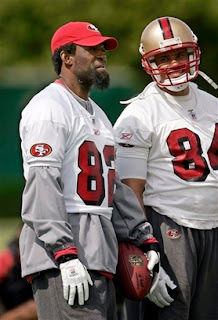 "San Francisco 49ers acquired veteran receiver Darrell Jackson (82) WATCHES PRACTICE with tight end Bryan Gilmore (84) during minicamp at 49ers training facility in Santa Clara, Calif., Friday, May 4, 2007." Although, I guess it's a little different, since he's actually at a minicamp for the Niners. But that's just splitting hairs.